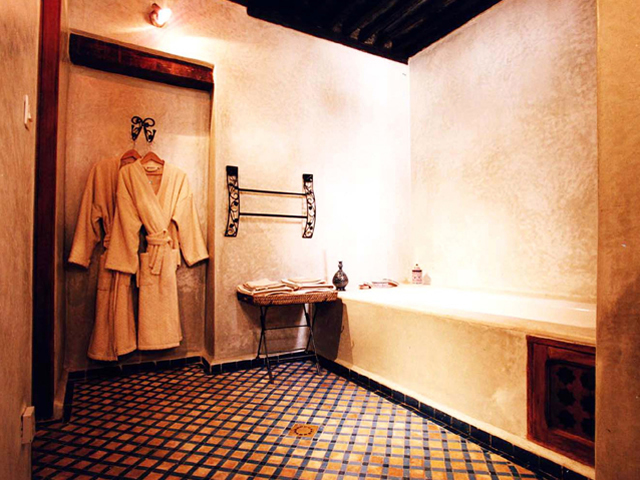 Ryad Mabrouka - Luxury Riad in Marrakech, Morocco. 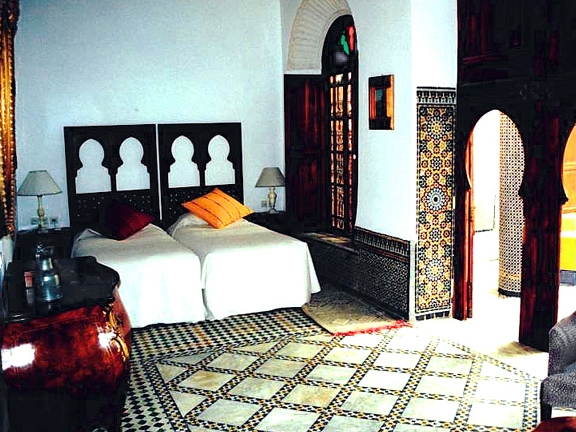 Book Ryad Mabrouka Today with Hip Marrakech - specialists in English Speaking Accommodation in Marrakesh, Morocco. 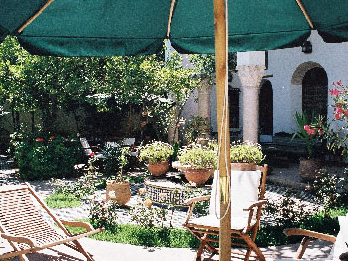 "Enjoy sitting in the shade of citrus trees in our Mediterranean style garden." Luxurious Guesthouse Featuring Eight Rooms. 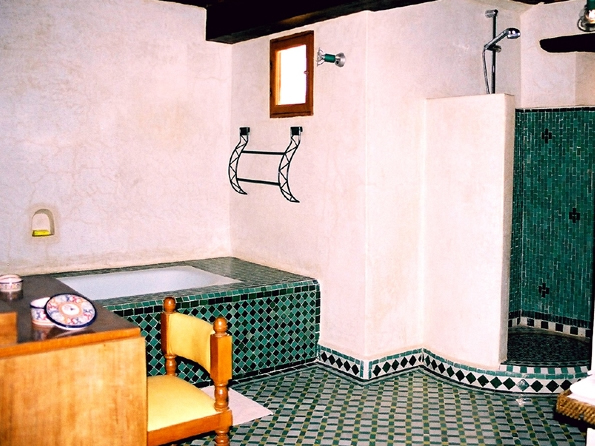 Riad Mabrouka is a luxurious guest house located in the heart of the ancient Medina in Fez. Despite it's central location, Ryad Mabrouka offers a haven of comfort and tranquillity from the flurry of activities of life in the bustling Medina. 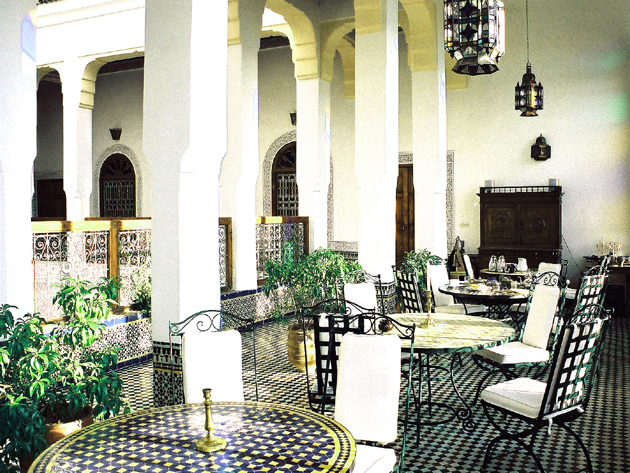 Let yourself be steeped in the ambiance of a traditional riad with all the modern conveniences. 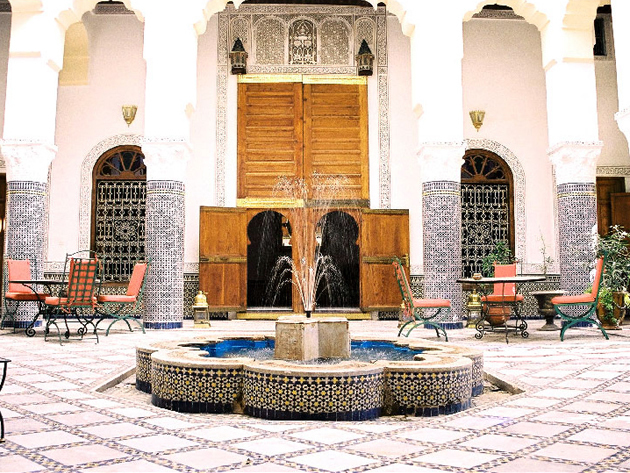 Meticulously and faithfully renovated according to the local traditions, the interior courtyard is beautifully decorated with sculpted columns, magnificent cedar wooden doors, a bubbling fountain and colourful Moroccan mosaics. This courtyard opens onto a fragrant garden of roses and citrus trees and a small, inviting swimming pool. 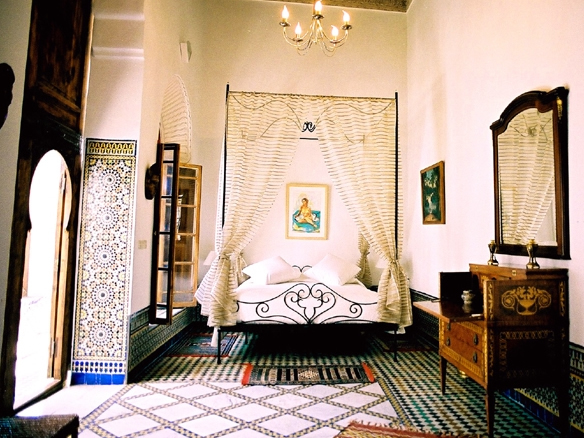 In keeping with the courtyard, all of our rooms have been restored in the Moroccan style with colourful "zelliges"(mosaics), sculpted plasterwork and decorated cedar wood ceilings. The spacious air-conditioned rooms, each with their own private ensuite bathroom facilities, are available with queen size or twin beds. Every single room is unique, and named accordingly. Throughout your stay our vigilant staff will remain attentive to your every need. Indeed, your stay at Riad Mabrouka is truly a moment to unwind and relax: you will enjoy sitting in the shade of the citrus trees in our Mediterranean style garden; lounging in front of our swimming pool; relaxing in the tranquil interior courtyard and unwinding with an aperitif or traditional mint tea on our panoramic rooftop terrace with its splendid views of the Medina and the surrounding hills. 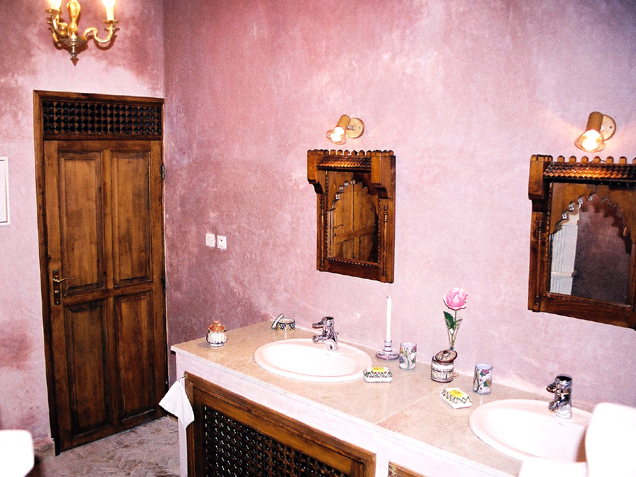 Alternatively, why not make use of our traditional hammam? All prices quoted below include breakfast. Double Room with small adjacent bedroom suitable for a child. 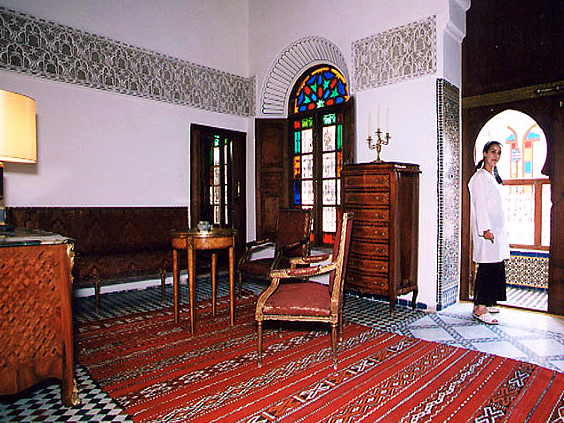 Located on the first floor, the traditional Royal Suite is decorated in the traditional style of Fez with mosaics, carved plaster and a painted ceiling. It is comprised of a main room with Queen-size bed, a small adjacent bedroom suitable for a child and an ornately decorated alcove. The large bathroom has a bath with a shower and a separate toilet. Room features: Air-conditioning, safe, WiFi access, Alcove. 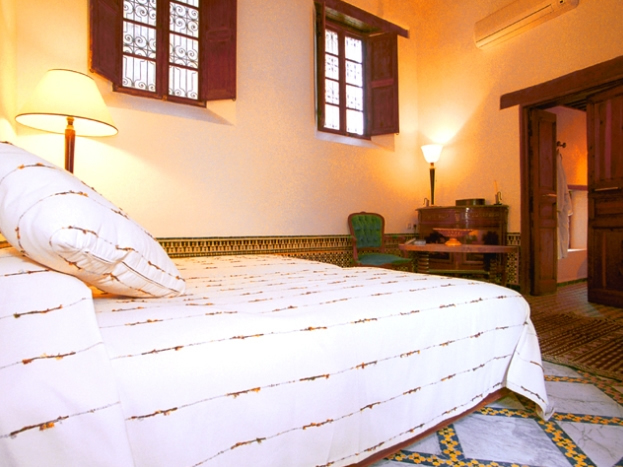 Located on the first floor of the Riad, the charming Amira Suite has direct access to the roof top terrace. 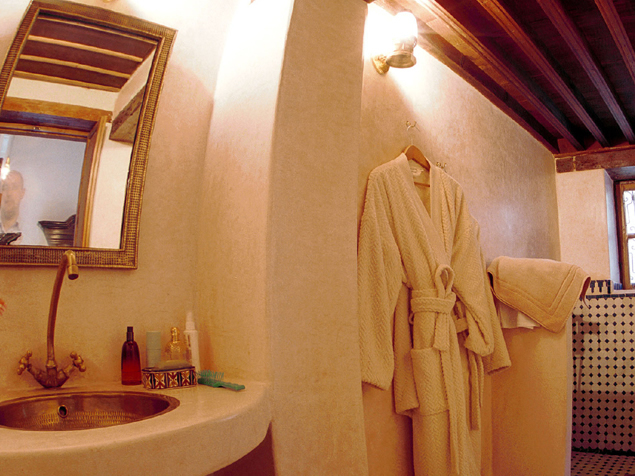 It has a four-poster bed, seating area, with a staircase leading to the large bathroom with bath and separate shower. Room features: Air-conditioning, safe, WiFi access. 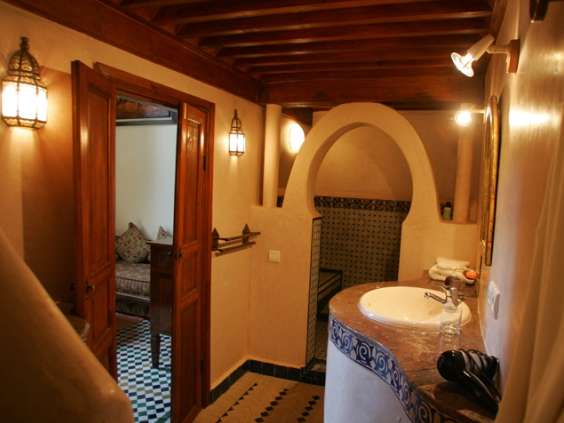 Located on the first floor the elegant Merinides Suite comprises of a spacious main room with Queen-size bed, seating area, and a bathroom with a Moroccan style shower. This room can be opened up to form a larger room with the Bayda Room upon request. Twin Room, Double Room available upon request. 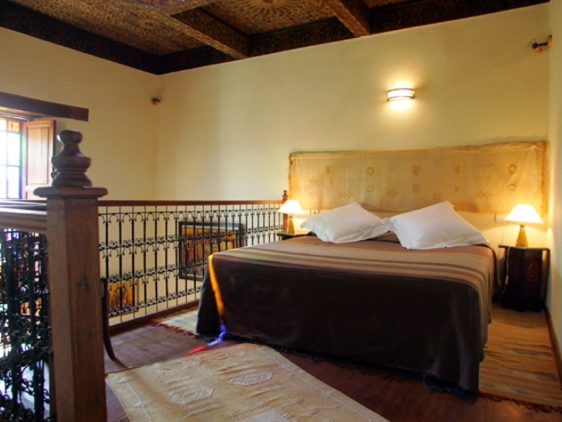 Named after the old town of Fez, "Fez el Bali", this spacious Twin room is decorated with traditional architecture of region. 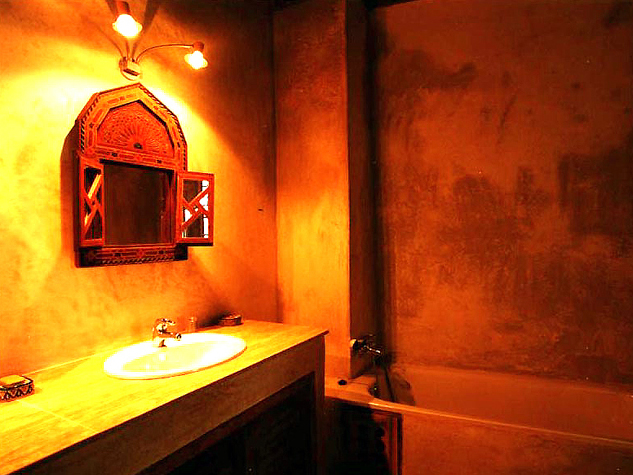 Expect beautiful zellige work and an ornate carved cedar tree doors which opens onto the patio. The room also includes a seating area and an ensuite bathroom with a shower. 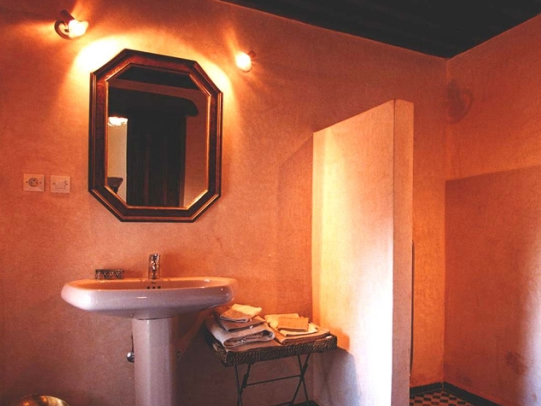 This delightful ground floor suite was named after the Nejjarine quarter of the Medina. The spacious room has a Queen-size bed, seating area, and a bathroom featuring a luxurious corner bath. Twin Room, Double on request. 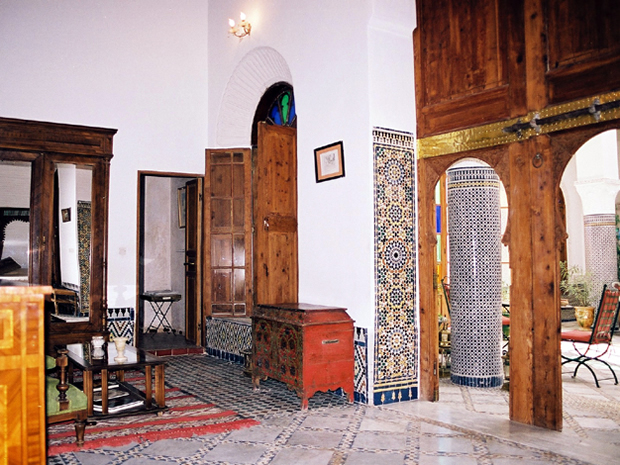 Located on the ground floor, the elegant Medersa Suite faces the garden door on the opposite side of the patio. It comprises of a spacious room with twin beds (double available on request), seating area and a bathroom with a shower. Located on the first floor, the charming Attarine room features a lounge with a large stained glass window overlooking the garden, a mezzanine bedroom with Queen-size bed and richly decorated ceiling. There is also a bathroom with shower. Located on the first floor, the charming Bayda Room features a beautifully decorated ceiling and comes with twin beds and a bathroom with a shower. This room can be opened up to form a larger room with the Mérinides Suite. 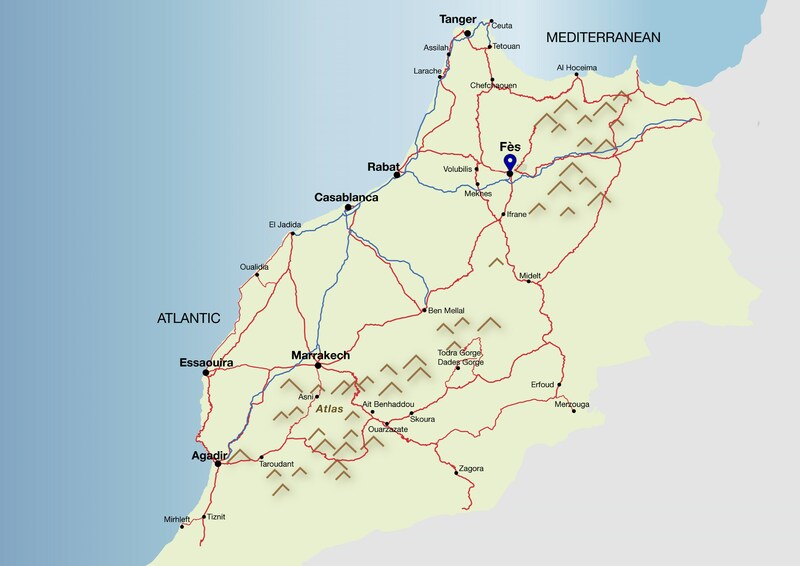 The base rate price at Ryad Mabrouka is in pounds, euros, or Moroccan dirhams and exchange rates are approximate. "My family and I loved our visit to Fes and the Riad Mabrouka was the perfect place to stay to experience the magic and mystery of Fes. We felt like we had stepped back in time -"
"What a stunning oasis ! Exceeded our expectations in every way. We thoroughly enjoyed the atmosphere, tranquil garden, warm staff and delicious food! Thanks for making our stay in Fes so memorable." "Very enjoyable stay -the rooms were wonderful, the staff were very helpful and the all place was very relaxing. I think my dad wants to live here..."
"Comfort and style superbly executed and maintained, a warm welcome from all staff even at 4am! Well done to all involved for a memorable stay. Delicious food and wine... Will tell our friends to stay here!" "We had a really great stay here in Morocco! What an incredible place Fes is! After a day wandering in the medina what better way of reflecting on all the sights, sounds and smells than relaxing in a perfect setting, an that is what Riad Mabrouka is! 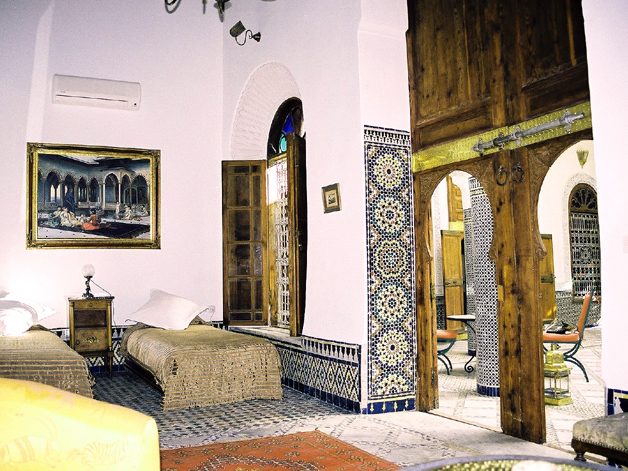 A beautiful riad with a lovely garden. But the best part? The staff, Michel, Caroline and all the staff were so friendly and helpful. The staff are always so cheerful it was a delight to meet them all! Thank you for a wonderful stay! We really appreciate it." "...We were not disappointed by its beauty and rather authentic look and feel. Everything was what we expected and the descriptions and pictures were accurate. We were treated like we were the only guests in the hotel." 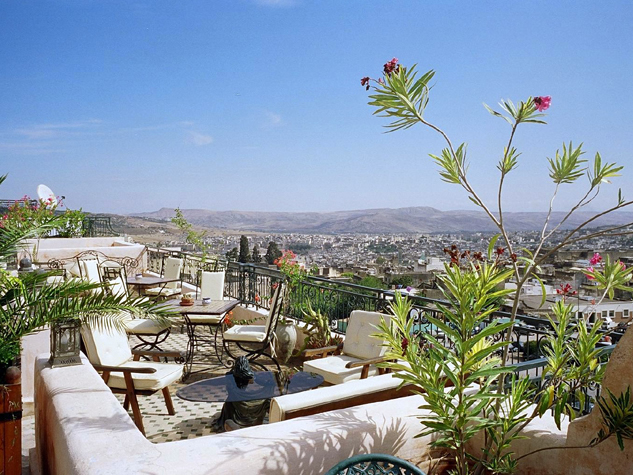 "We have stayed at Riyad Mabrouka on a number of occasions, mixing leisure and pleasure with business. 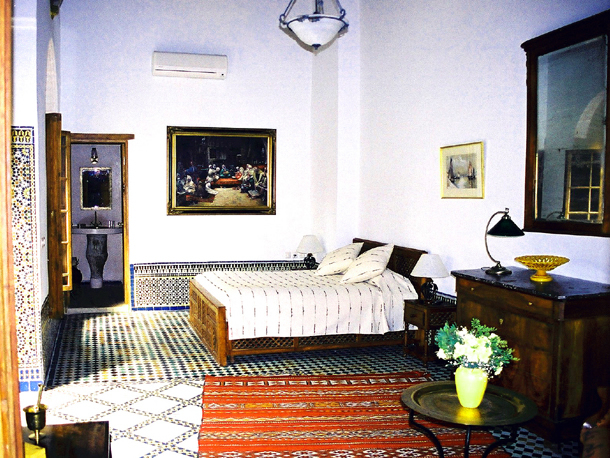 Rooms are delightfully decorated with authentic Moroccan furniture, paintings and artefacts. 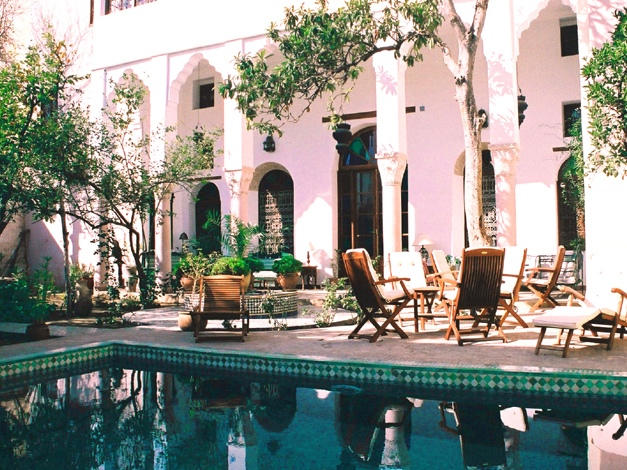 The courtyard, with its huge mosaic decorated columns and its tinkling fountain, leads into the garden where breakfast and dinner are taken under the orange trees beside the plunge pool. The staff are efficient and friendly." Best Price Guaranteed! All prices match or are lower than those charged directly by Ryad Mabrouka. We can check availability at Ryad Mabrouka for you, process your booking and assist you in finding alternative dates and accommodation if your first choice is already taken. 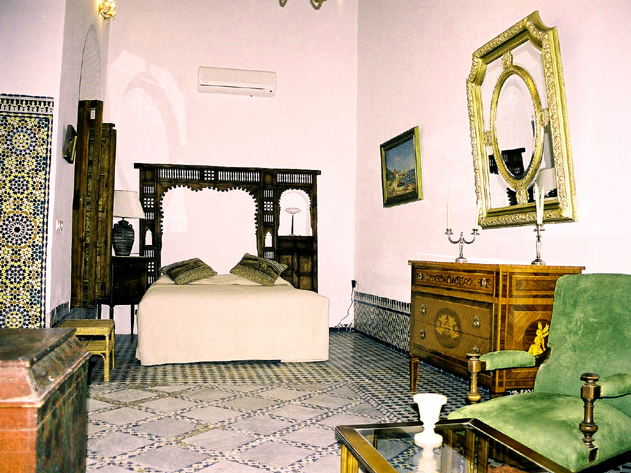 Every member of our team has expert knowledge of each riad including Ryad Mabrouka and can provide more information about the rooms, the location and how well suited it is to your specific requirements.